A tattooed rocker and an uptight music teacher - who says God doesn't have a sense of humor? Candi Canaberry has been the worship leader at Cornerstone Fellowship since the doors opened. Candi has dedicated her life to praise and worship, so when Cornerstone explodes into mega-church territory, Candi is sure she’ll be the one to take her team to the next level…isn’t she the obvious choice? Apparently not. Church leadership has other ideas. She’s given a partner to share her duties. But a one-time rocker with zero praise and worship experience? Recently saved Samuel “Shade” Blackledge is new to Cornerstone Fellowship. He’s convinced a strong church family is what will help keep his head above water as he turns from things of the past and builds a new life. 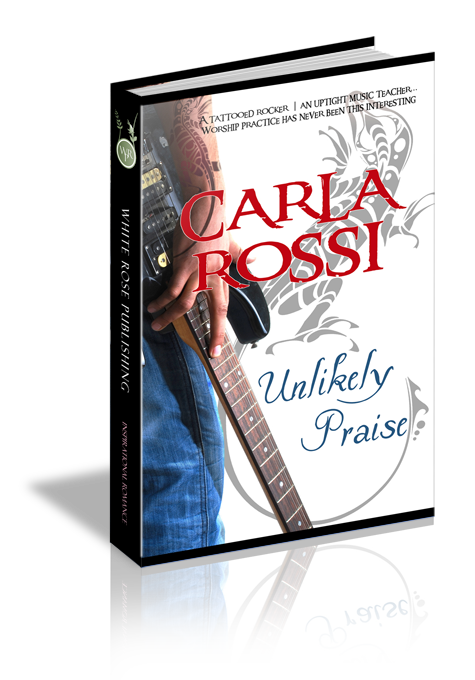 Ex-Dead Lizard rock guitarist, Shade is shocked when the pastor suggests he might be just what the worship team needs. But could God really want a tattooed veteran of the club scene? And what about his less-than-Godly lifestyle to this point --not the least of which is a baby girl he’s never seen? Worship practice has never been this interesting as Candi and Shade work their way toward each other…and Unlikely Praise. Samuel Blackledge, the guitarist I told you about, will be visiting practice tonight. I know you’ll make him feel welcome. We’ll all get together next week to discuss the changes we talked about. Let me know how it goes. Candi Canaberry whipped into the parking lot of Jake’s Music Emporium and slowed just in time to swerve around the old, bronze-colored Ford truck that blocked part of the entrance. She glared at the empty clunker with the missing tailgate as she inched her way around it. She found a tiny space as far away from the truck as possible and safely parked her new silver Acura. She glanced at her watch as she got out. Six fifteen. She hated not getting to worship practice an hour before everyone else. Now she wouldn’t have time to pray and prepare. And this was one day she needed that time. She flung open Jake’s door and pulled off her sunglasses. The owner’s nephew leaned against the counter as he talked with a customer. She stopped hard and grimaced in pain as every sore toe in her new high heels slid forward and pinched against the pointy ends. “OK,” she squeaked and stepped in line at the counter. She glanced at her watch again and crossed her arms in frustration. The day just kept getting better. First, the Dean of Fine Arts wanted to add another Music Appreciation class to her already overloaded fall teaching schedule. Apparently, that kind of thing happened when you were the youngest and newest member of the faculty. Then he called an “emergency” staff meeting to discuss final exams when, as far as she was concerned, the only real emergency was that she wore new heels on a day she thought was going to be a short one. Add to that the reckless student who almost mowed her down on the way to the faculty parking lot. And the bozo with the stellar parking job in Jake’s too-small lot. Even the persistent headache she thought she’d conquered at lunch now moved and throbbed at will each time she blinked. And Kyle just kept talking to the ponytailed rock-star-wanna-be customer as if she had all night to admire his torn jeans, his Clapton vintage tee, and the hideous tattoo that exploded up his left forearm in vivid shades of green. What was that thing anyway? A snake? A frog? She tilted her head to see it clearer, but then thought better of it as her migraine intensified. She didn’t need to know, anyway. Then he hooked his thumb in his front pocket and the whole ugly picture became clear. Ooohhh...a lizard... But it wasn’t cute like the green anoles she’d seen hopping from leaf to leaf in her holly bushes, and it certainly wasn’t cuddly like the gecko on television. No, this was a fierce lizard with demonic red eyes, and a barbed tail that curved around the man’s wrist. Since when did lizards have barbed tails? Since when did she care? He turned, and his green-gold gaze met hers before he gave her a quick head-to-toe. The customer gathered his bag and headed for the door. “Oh, I’m not new to Texas, or to Spring. I just haven’t been back here in a while.” He paused to offer one last smile and nod—and it wasn’t for Kyle. His perfect teeth combined with the deep rugged slashes around his mouth, revealed a surprisingly handsome man, if you could forget the whole rock-star vibe in the rest of his appearance. It almost made her forget she thought long blond ponytails only looked good on ten-year-old girls. But it was so hard not to be anxious or worried when everything she knew and worked for was about to come crashing down. She’d given Cornerstone Fellowship every Sunday morning and Tuesday night for the last two-and-a-half years. Two-and-a-half years of practice, two-and-a-half years of everything she had as a musician, a leader, and a teacher. Two-and-a-half years of preparation for the day when those small services with fifty regular members exploded into an overflowing congregation who demanded a whole new sanctuary to house them. That day had come—and she couldn’t feel more left behind. Shade made a sharp left out of Jake’s parking lot and attempted to ease into the far right lane. Driving the old truck and shifting gears was a lot like deactivating a bomb. If he didn’t press, push, and pull everything at just the precise moment with just the right amount of pressure, the whole thing could simply blow up. Metal ground against metal and third gear settled in with a clank. That would have to do. He leaned across the seat and pulled his grandfather’s pocket watch out of the glove compartment. “Uh-oh,” he muttered and placed it back inside. Just forty minutes to get home, clean his rollers, wash the paint out of his hair, and get back to church. He pressed the accelerator further onto the rusted floorboard. He couldn’t be late for his first praise and worship practice, especially since he was pretty sure that was the worship leader he’d just seen at Jake’s and she already looked annoyed. So annoyed, in fact, he resisted the urge to introduce himself properly in case it wasn’t her. Or maybe in case it was. He pulled a CD out of his bag and wrestled with the plastic wrap. He gave up on the CD and tossed it aside as he turned into the drive of the small mobile home park. Children darted in and out of yards along the narrow streets. Everyone paused to wave whether they’d officially met him or not, and friendly smiles from the kids across the street made it easy to nod and feel welcome in his new neighborhood. He was home now, and this time he’d get it right. He owed it to Pete, he owed it to baby Rachel, and he owed it to himself. He grabbed his bag and touched the silver cross that hung from his rearview mirror.